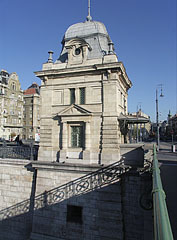 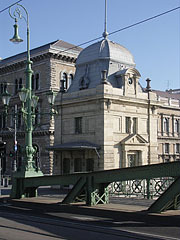 In the background it is the Central Market Hall. 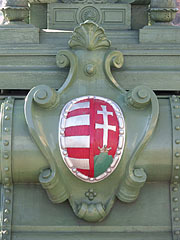 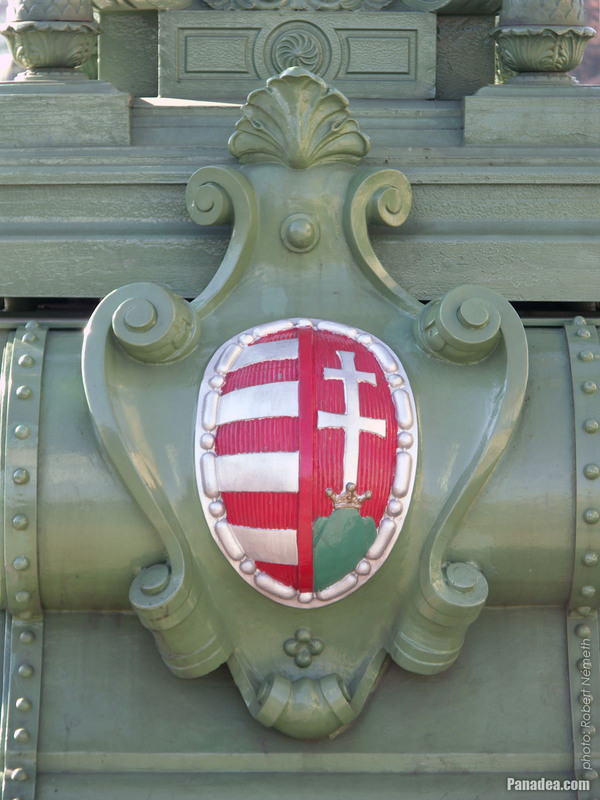 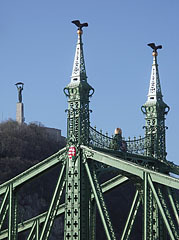 Coat of arms of Hungary and sculptures of turul birds on the pylon (tower) of the Liberty Bridge or "Szabadság híd"
The Liberty Bridge or Freedom Bridge (also known as Freedom Bridge, in Hungarian "Szabadság híd") or as it was called initially the Franz Joseph Bridge ("Ferencz József híd") was designed by János Feketeházy, it was opened in the year of the Hungarian Millenium in 1896. 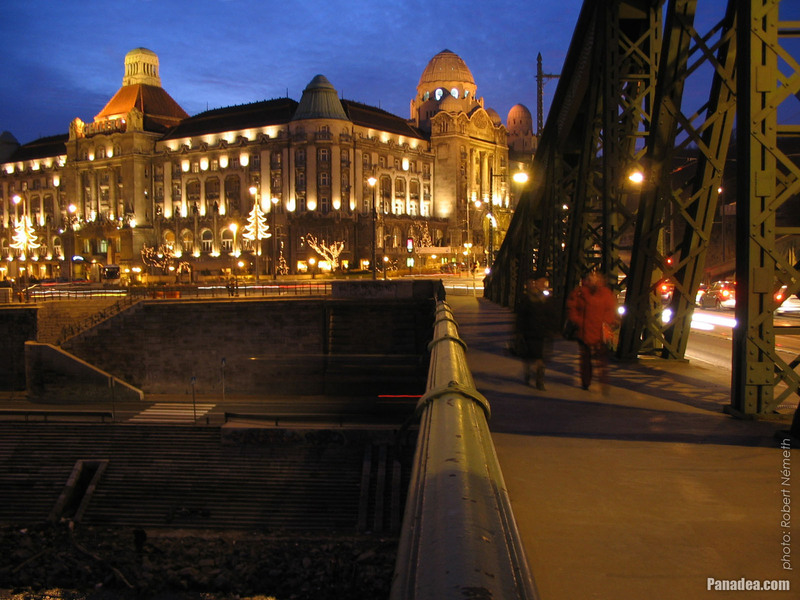 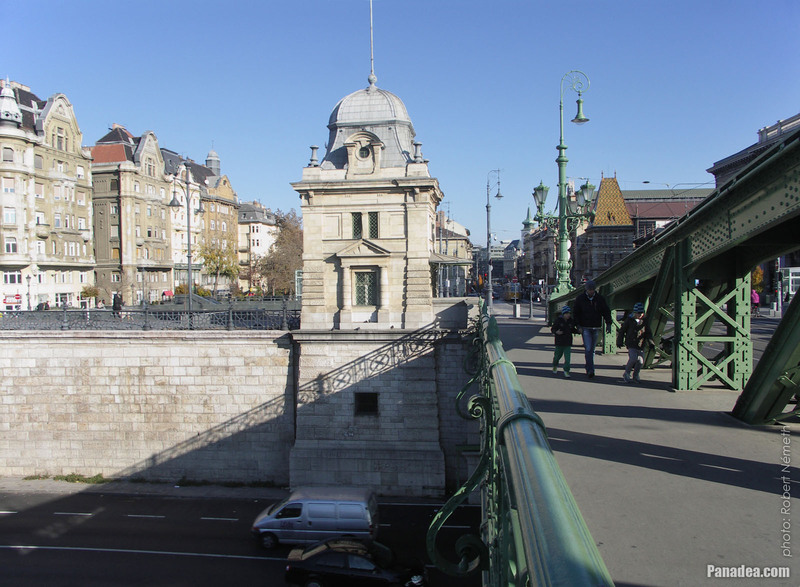 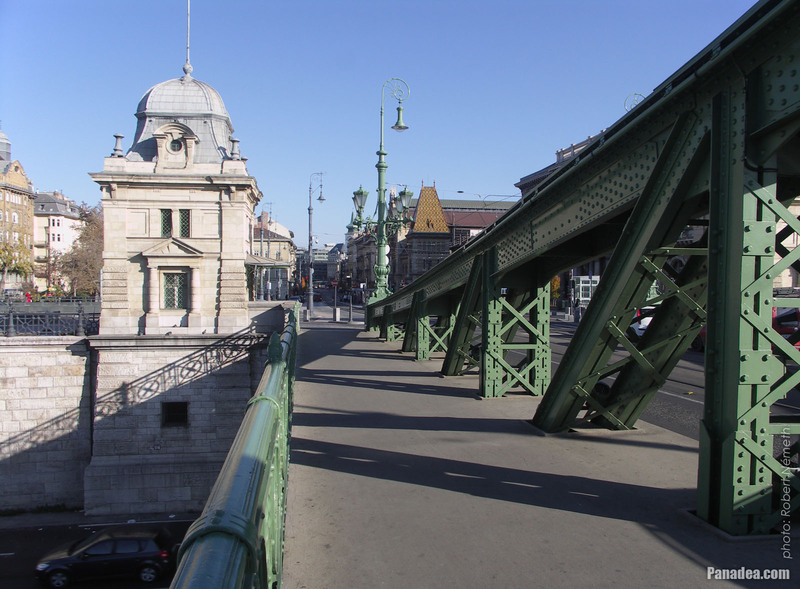 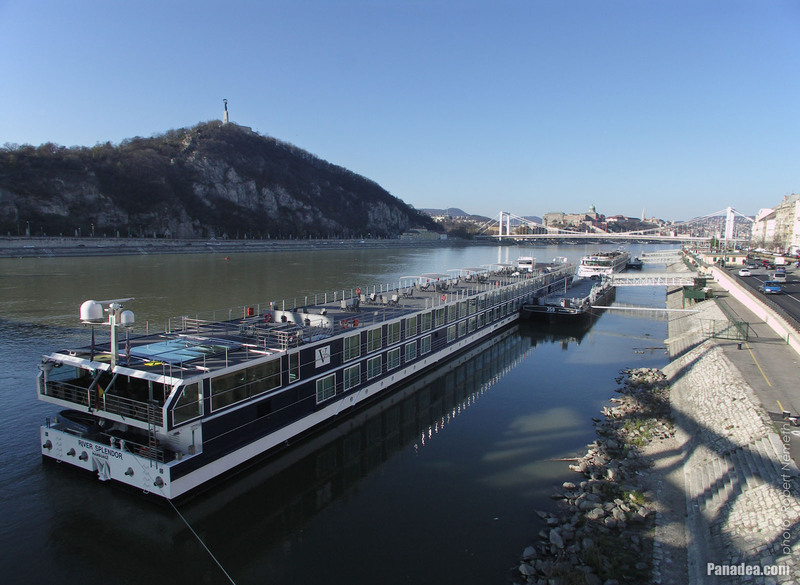 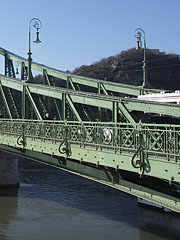 This was the third permanent road crossing over the Danube in Budapest. Even then the bridge already had tram tracks, as well as electric and gas lighting. 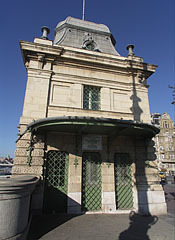 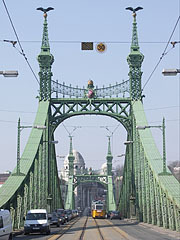 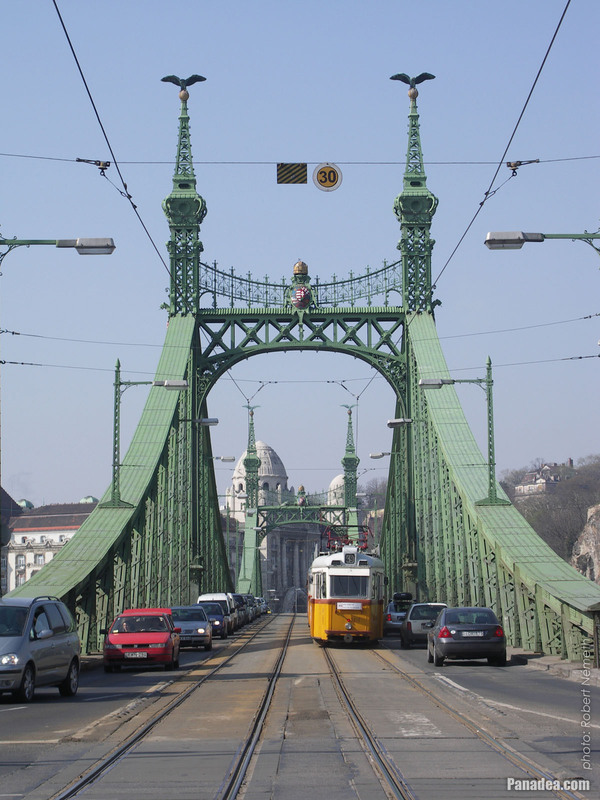 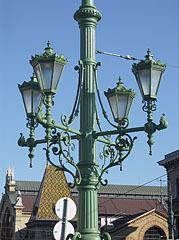 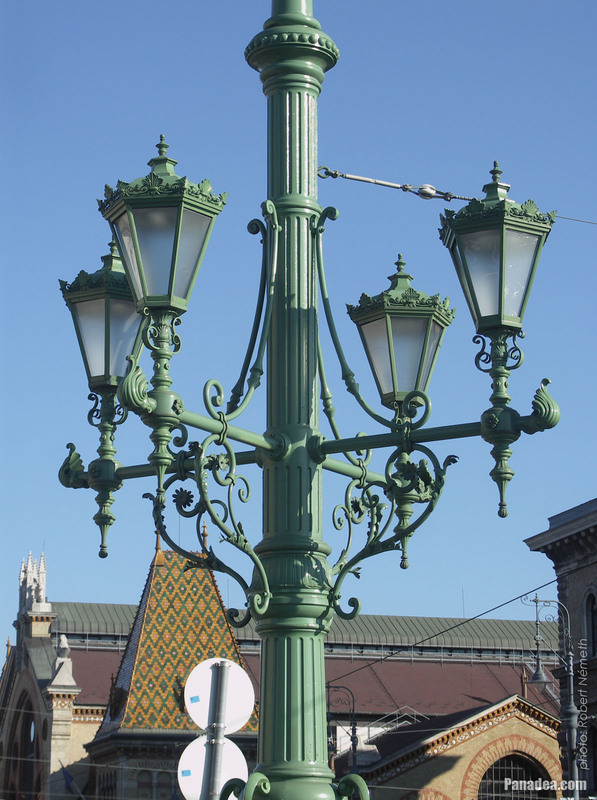 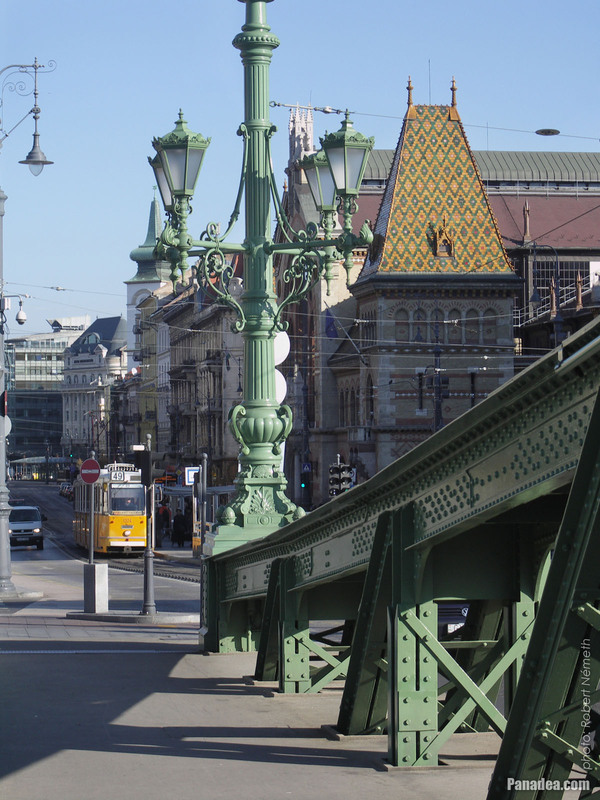 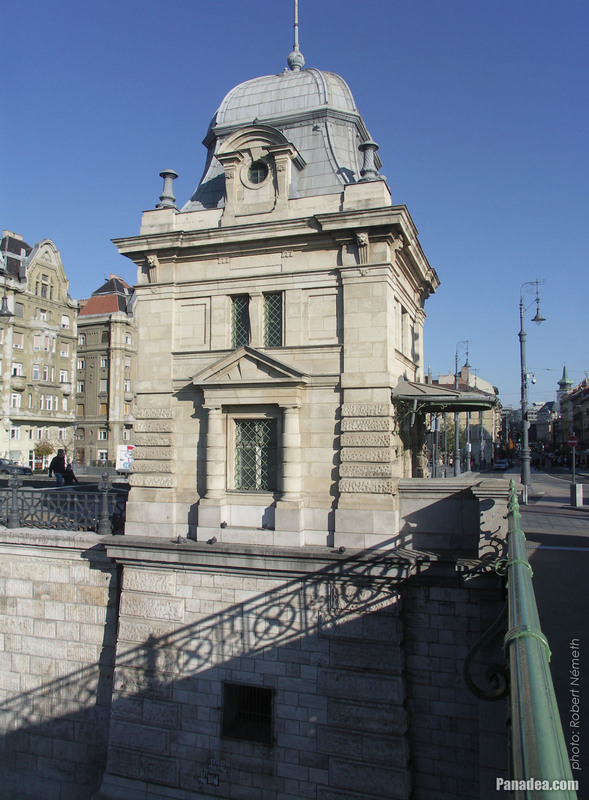 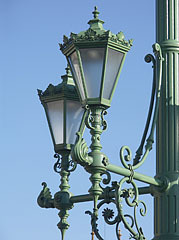 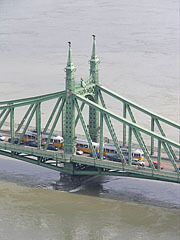 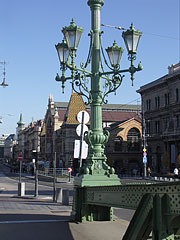 The first tram went throught the Liberty Bridge ("Szabadság híd") in 1898. 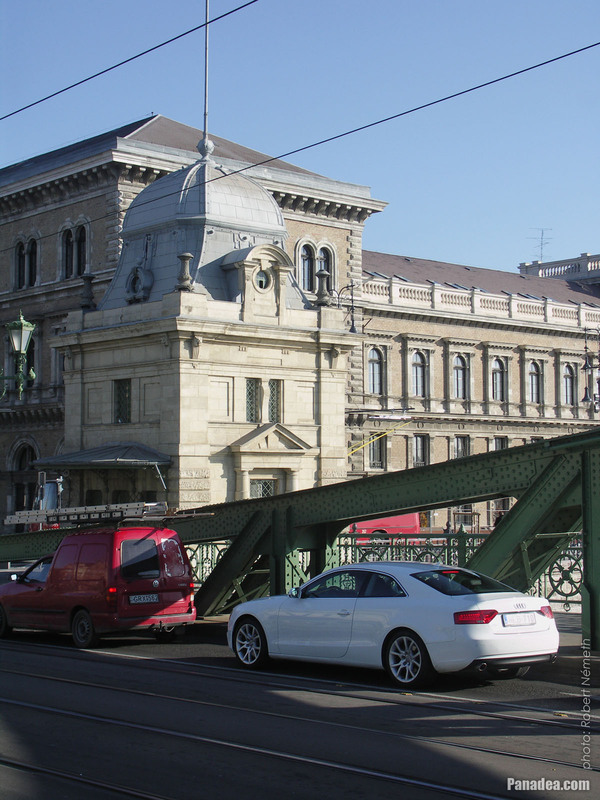 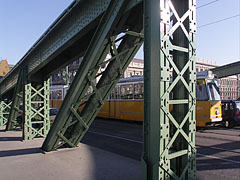 At that time the tham tracks were on the sides of the bridge deck, and the tram used a conduit current collection system (the electric wires were on the ground) to get the power. 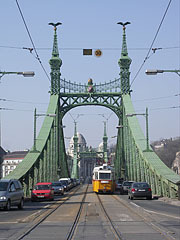 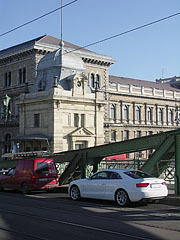 The tram line was converted to overhead wire system in 1923, and from 1928 also the bus traffic was started on the bridge. 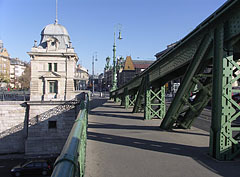 Then in 1938 the rails were moved to the middle of the road, as it can be seen today. 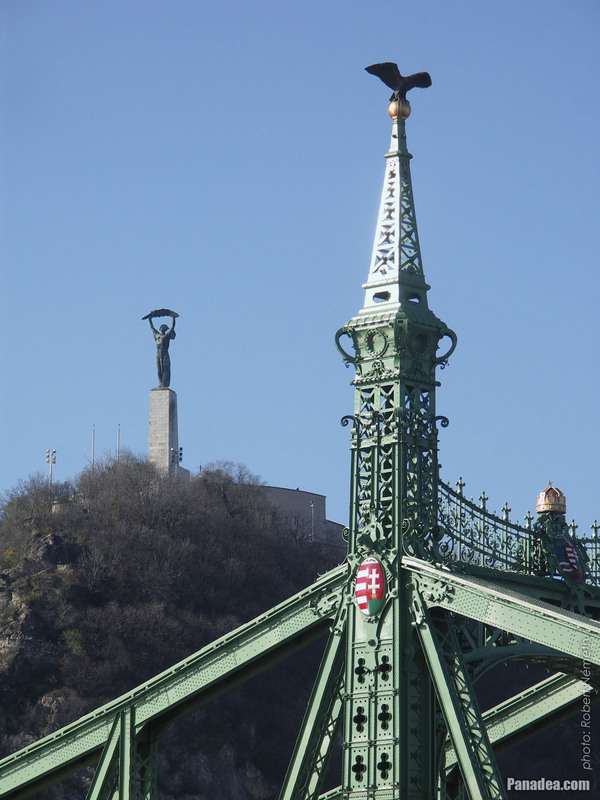 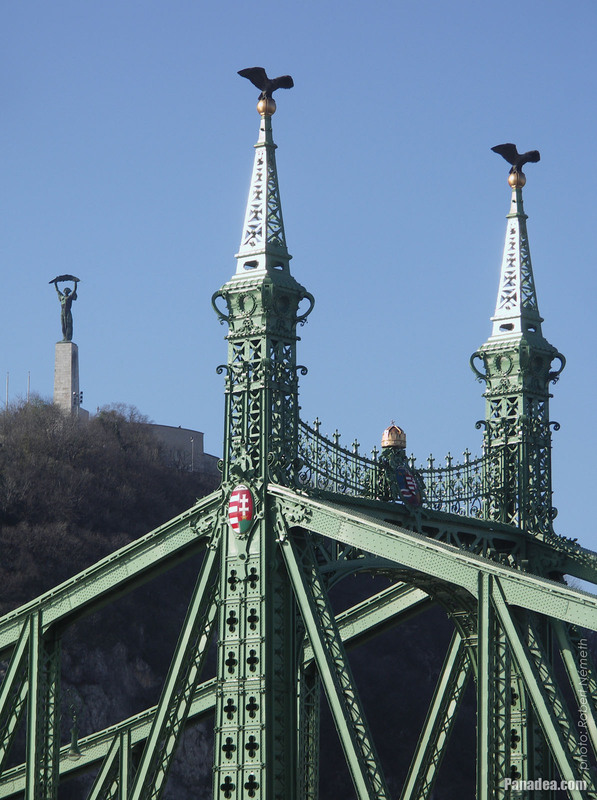 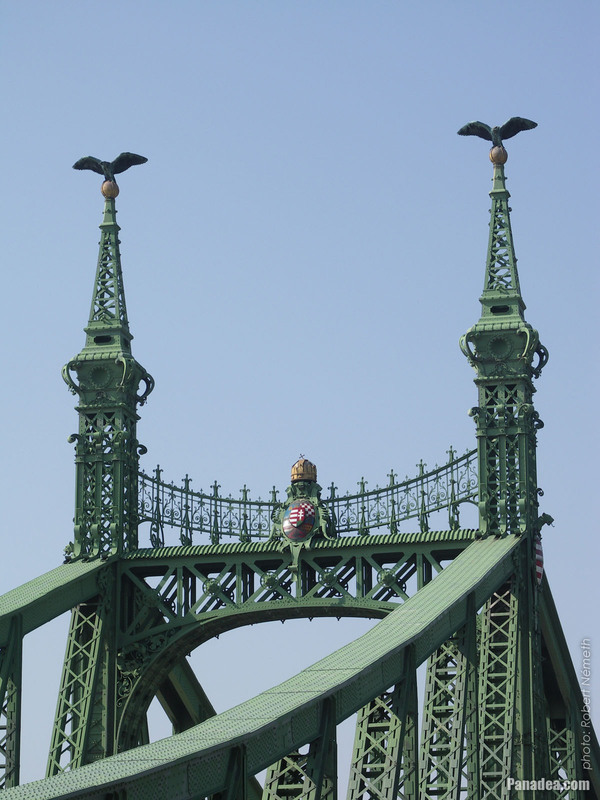 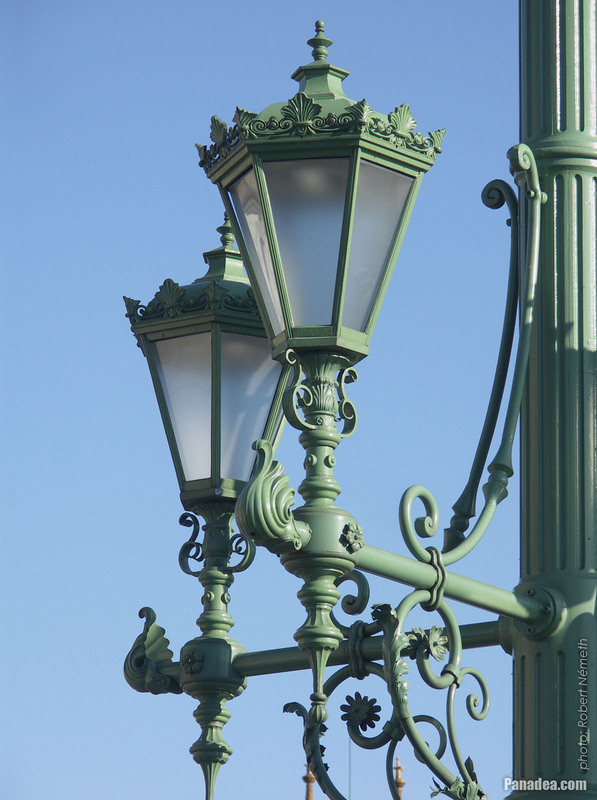 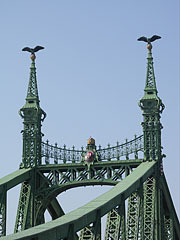 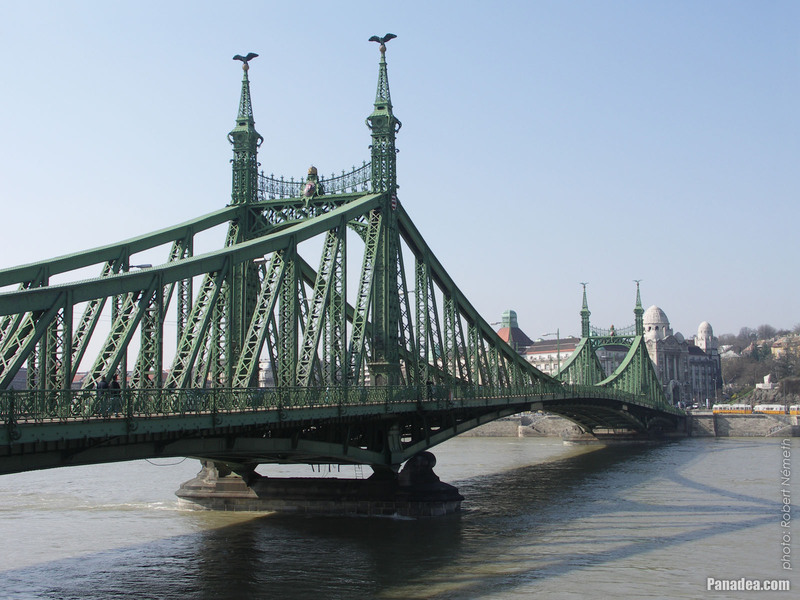 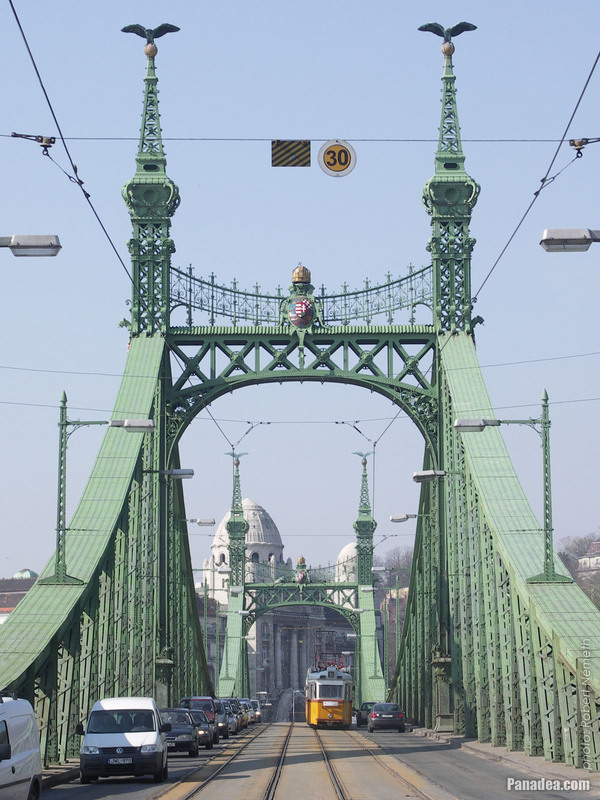 Another characteristics of the Szabadság Bridge or Liberty Bridge are the statues of turul birds with outstretched wings on the top of the pylon gates that were designed by Virgil Nagy, as well as the historical Hungarian coat of arms on the gateways (all of them were made in 1896). 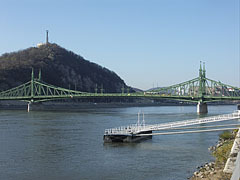 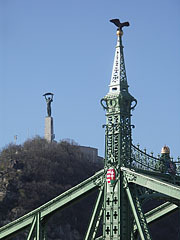 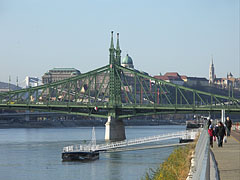 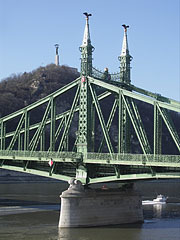 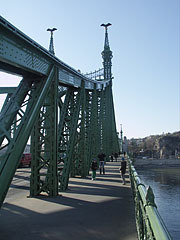 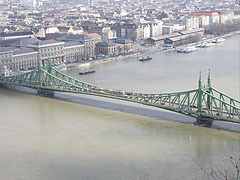 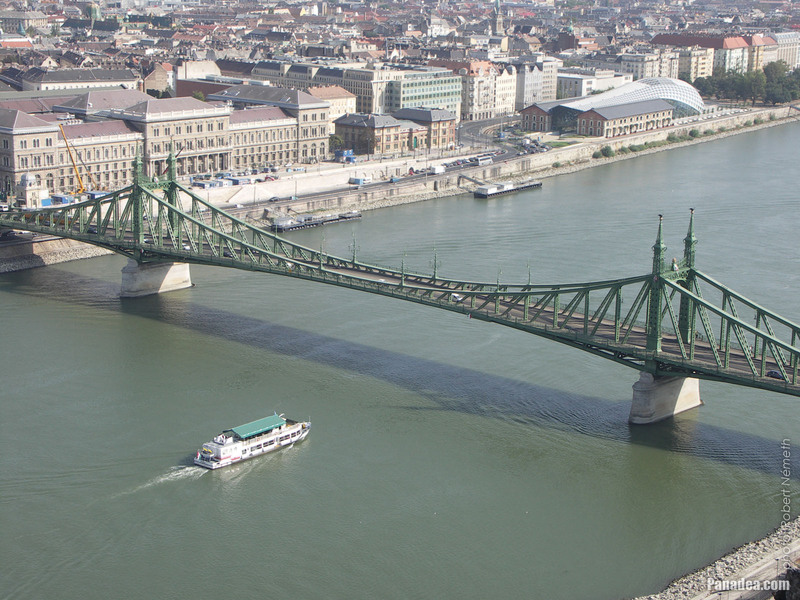 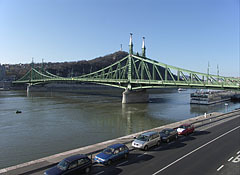 The Liberty Bridge (or Freedom Bridge, in Hungarian "Szabadság híd") is the shortest among the Danube bridges of Budapest. 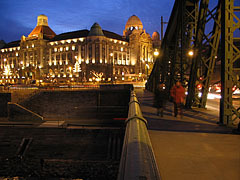 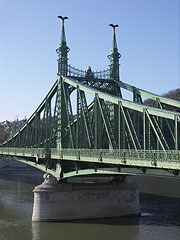 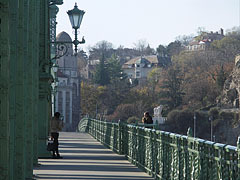 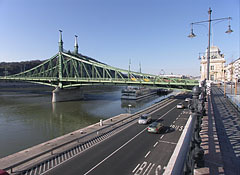 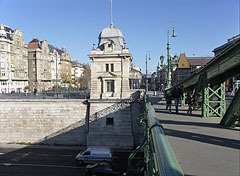 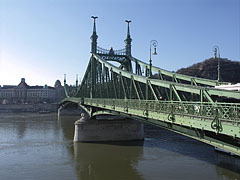 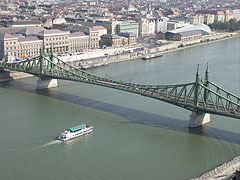 Before the World War II it was called Franz Joseph Bridge or Fővám Square Bridge ("Ferenc József híd" or "Fővám téri híd"). 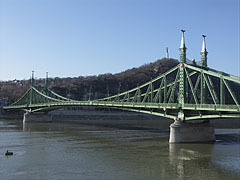 At the end of the World War II the bridge was blown up by the retreating German troops, like every other Danube bridge of Budapest. 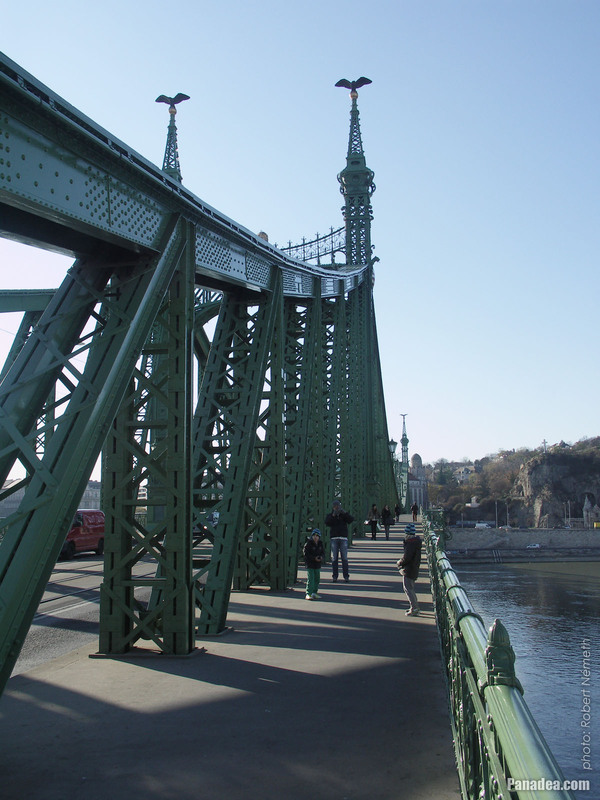 But the piers (more precisely the pylons) were remained intact and also the reparation of the middle section could be done relatively quickly. 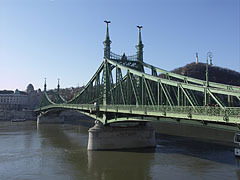 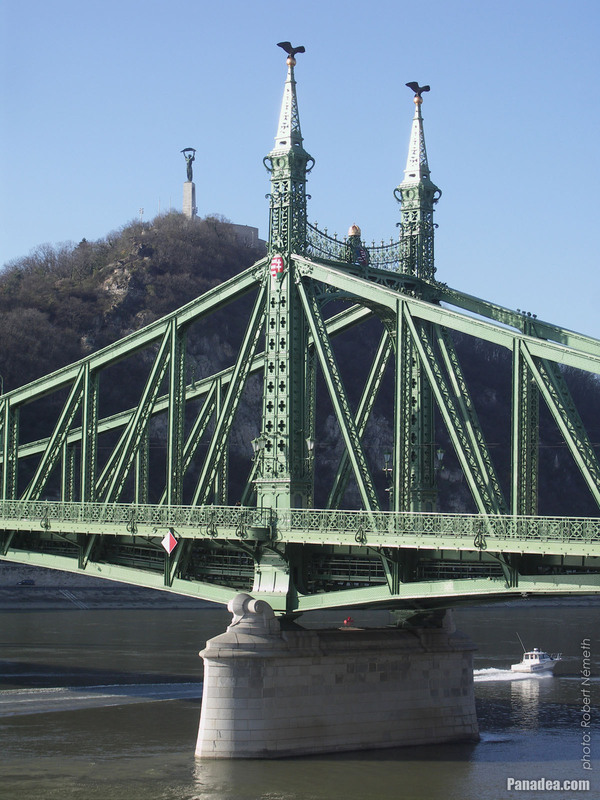 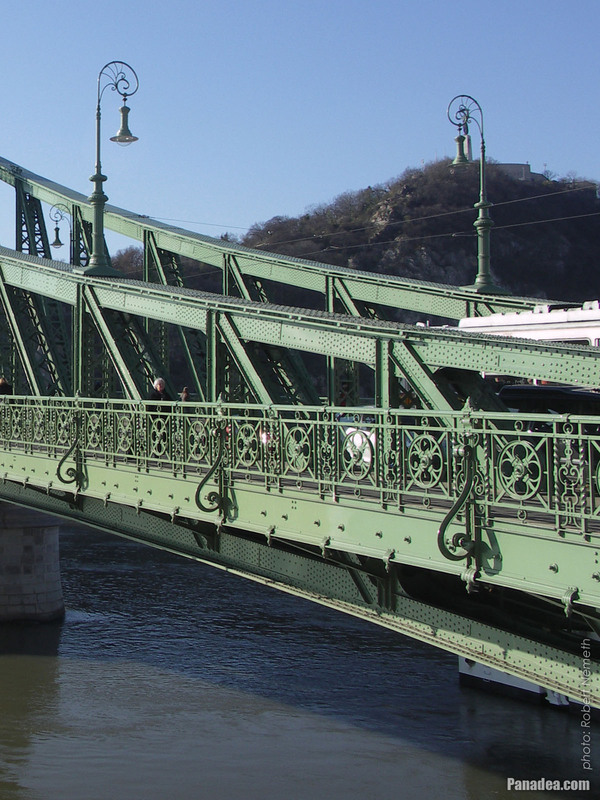 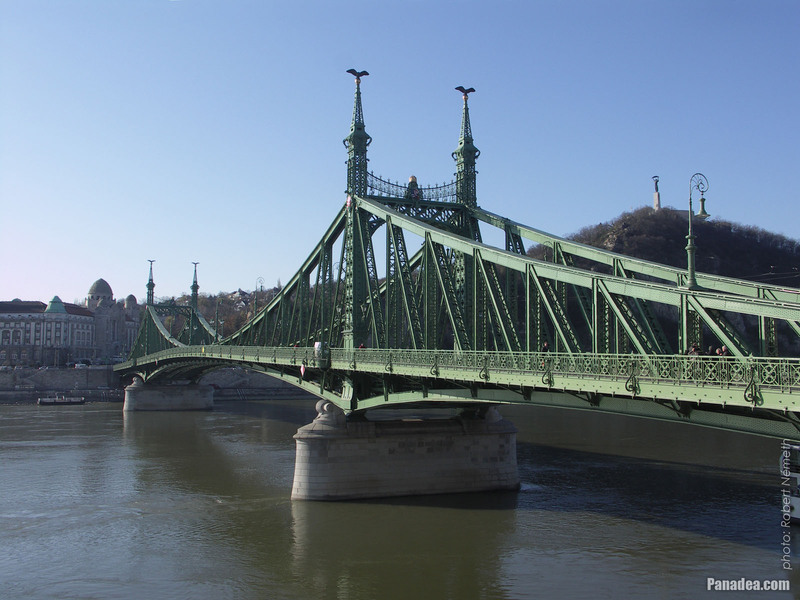 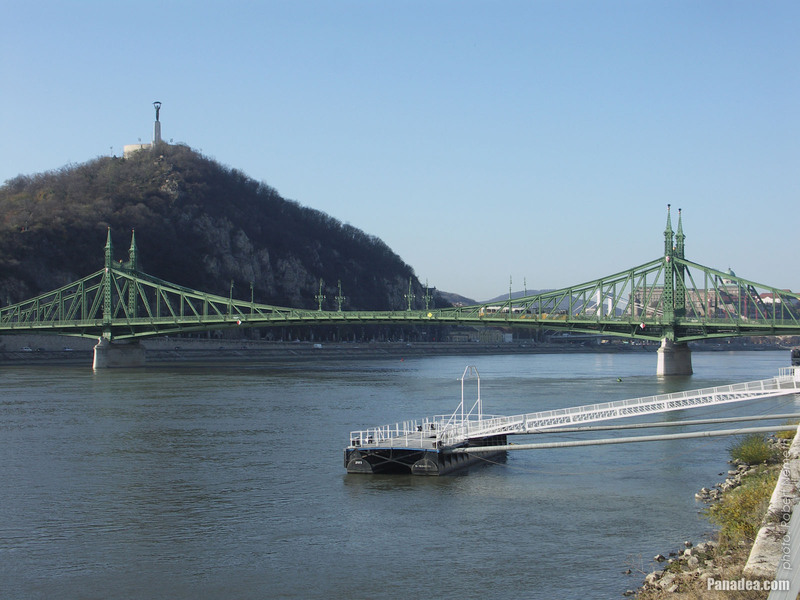 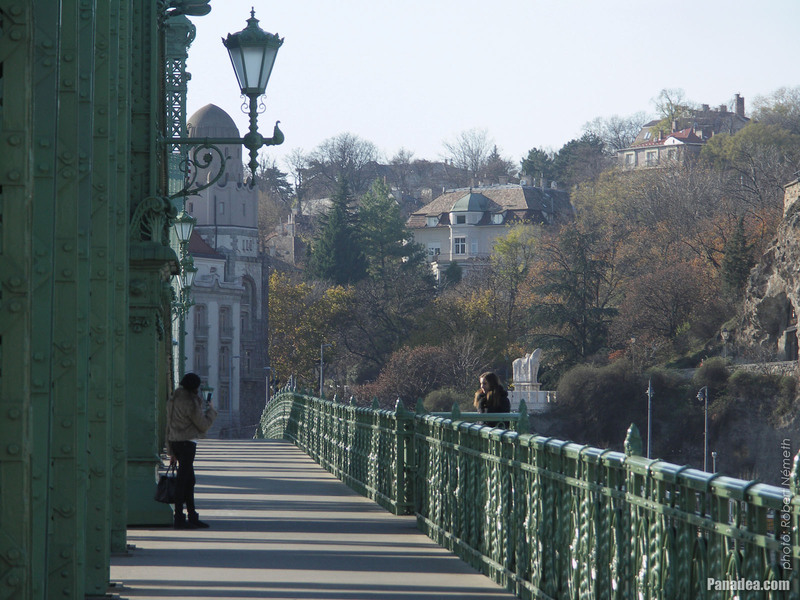 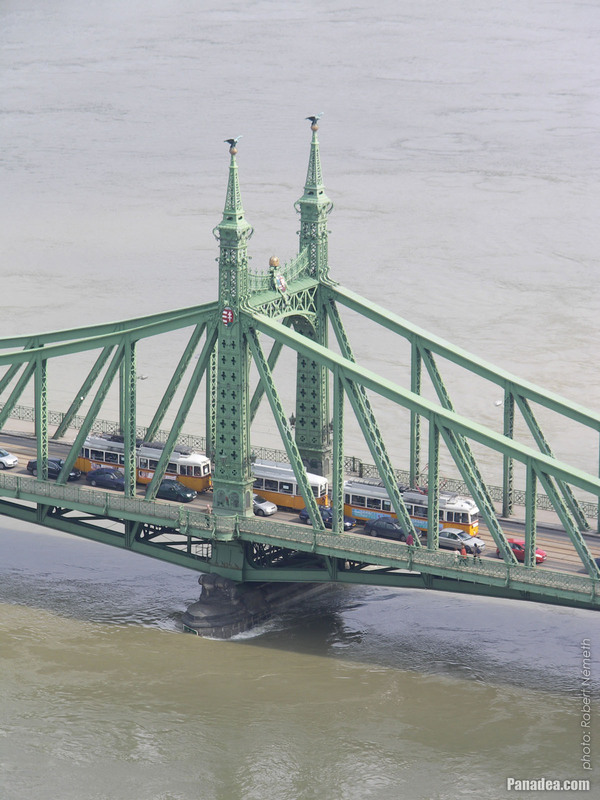 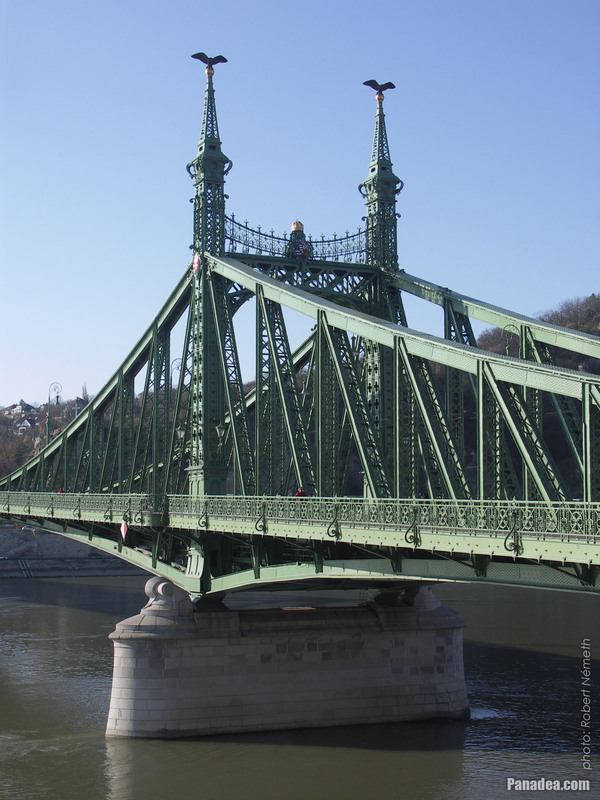 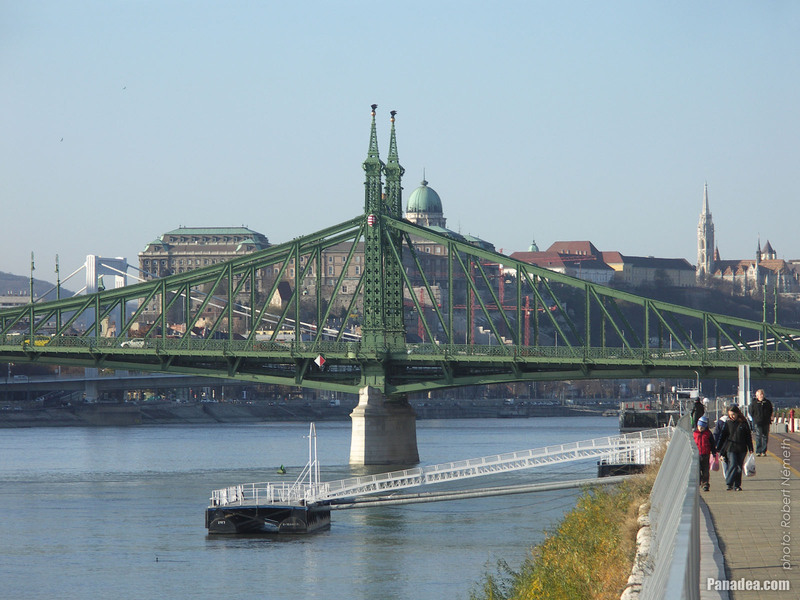 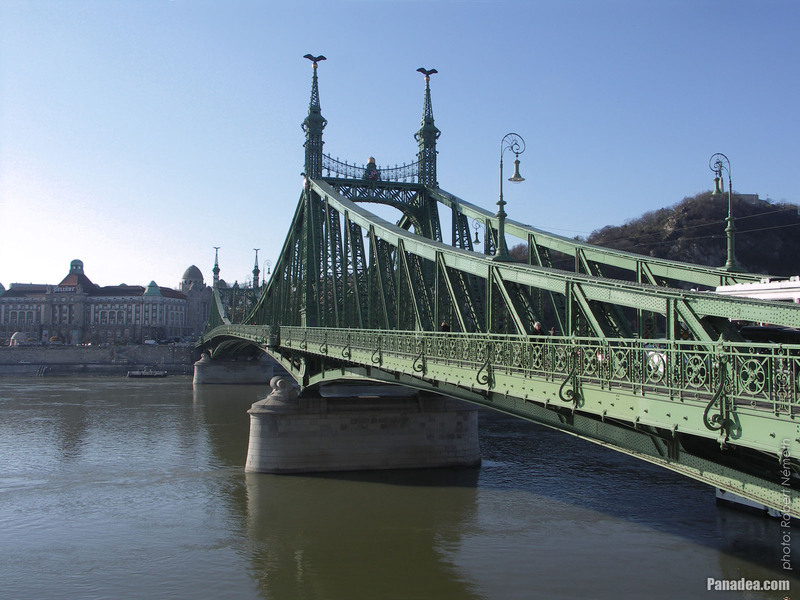 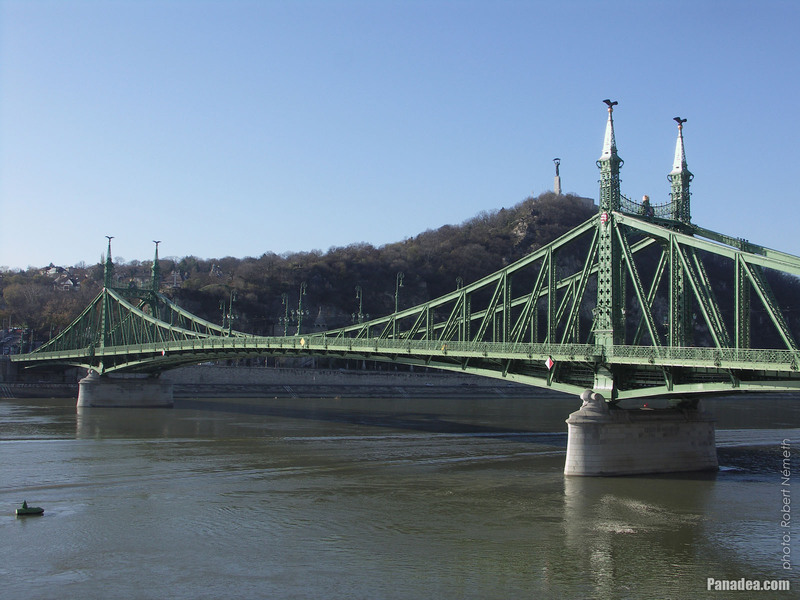 The reconstruction was done soon by the plans of Pál Sávoly architect, in 1946 it was already opened for service and then got its new name: "Szabadság híd" (in English "Liberty Bridge" or "Freedom Bridge").